More than just ordinary cat products! If you have pets you’ve probably noticed how unpleasant the water bowl becomes. Once it sits out and catches some dust, some flies and who knows what else, the water isn’t very appetizing for your beloved pets. That’s why the creators of the Drinkwell created this innovative new product for pet lovers everywhere. 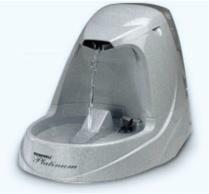 The Drinkwell cat fountain doesn’t just keep the water flowing in a constant stream, it also filters the water removing any unhealthy and unpleasant impurities. Now your cat can y fresh, healhy water all the time – even when you’re not there to refill the water bowl.